Get Our Free Tips To Learn English Now! What should you say in English when you meet someone who is a parent and has a baby in their arms? You have to acknowledge that they are holding a baby! So what can you say? Today we’ll show you what to do in American culture and what to say to build that connection! Today our listener Erico has a great question! Don’t assume you can just go up and touch the baby. Americans take personal space seriously. The mom might be concerned about germs. You should ask if it’s ok to touch the baby. Make sure you understand every word you hear on All Ears English. 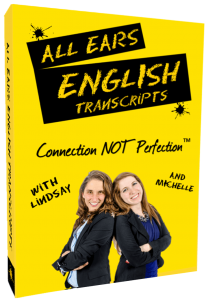 Bring your English to the advanced level with new vocabulary and natural expressions. Get the transcripts from today’s episode. Learn to speak naturally with the American accent. Click here to download them instantly. Is it a boy or a girl? What questions do you have about today’s episode? Let us know in the comments below. ← AEE 545: Clean Up Your Act and Listen to Today’s Episode!